parts all ready to go. But we got a great deal on the package, so we went with it. 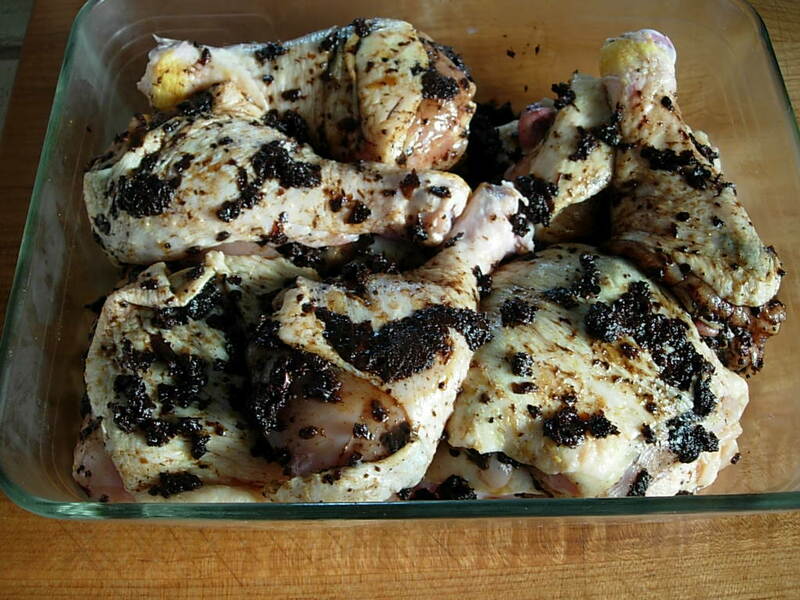 We coated the chicken parts, by hand, with the Pickapeppa Jerk Seasoning… getting under the skin, as well as on top. We then placed the chicken in the Fridge to marinate overnight. 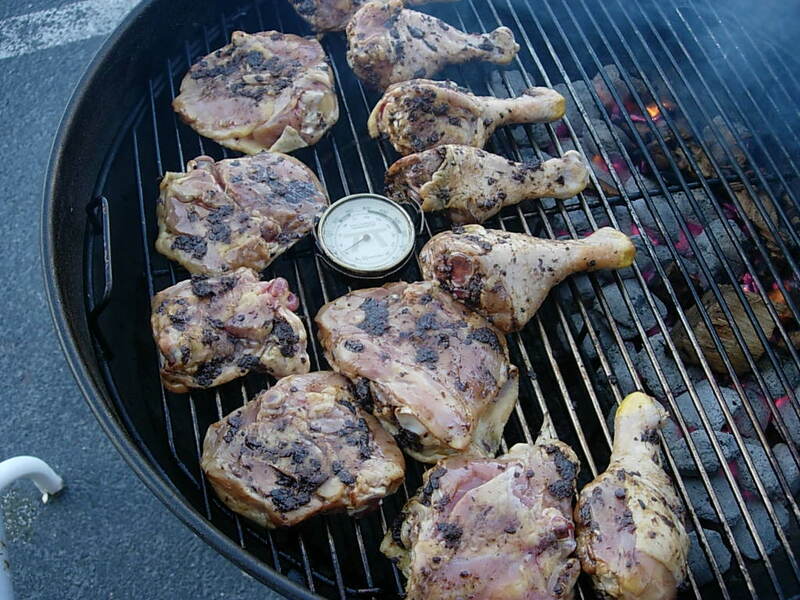 We grilled ’em, sauced ’em, and then ate ’em. The End……………. Oh. You want more details? The Grillin’ part: I set up the Weber Kettle for a 2-zone medium fire. A handful of wood chips were tossed on the hot coals. The chicken was placed skin-side down and cooked for 1 hour over indirect heat. (About 250-275°) Tip: point the legs towards the fire. 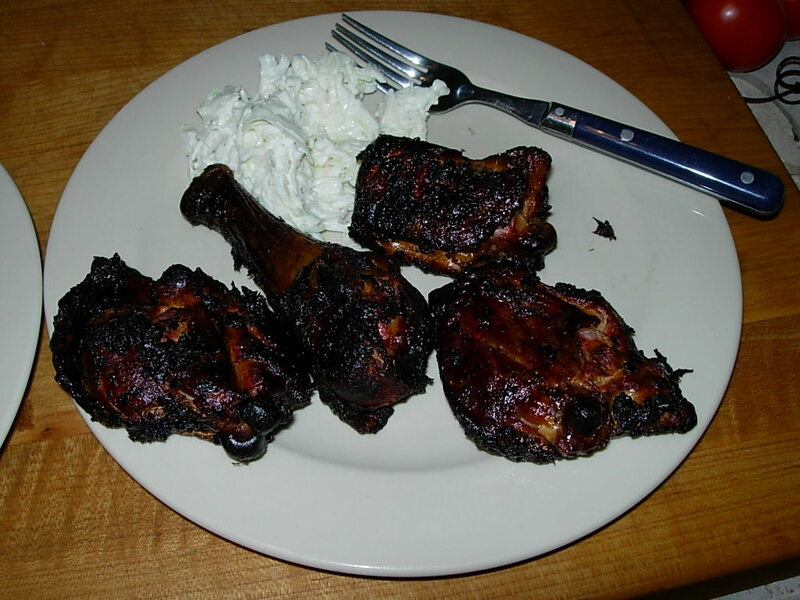 After 1 hour, the chicken pieces were flipped over, and cooked for another 45 min. to 1 hour. At this point, add more charcoal to keep things going, and throw some more wood chips on the hot coals. Within the last 20 minutes, I basted the pieces a few times with the Bone Suckin’ / Busha Browne mixture. 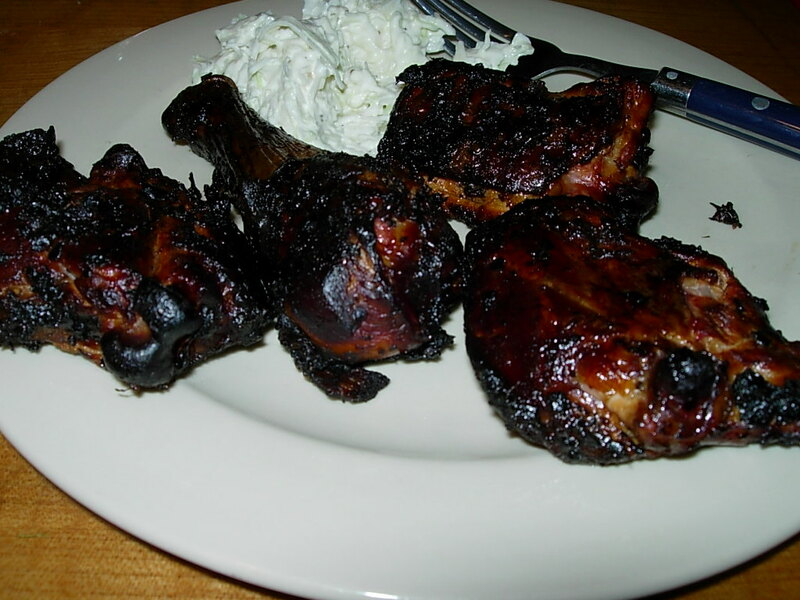 This created a wonderful, sweet, spicy glaze as you can see in the pics. I hope this recipe inspires you to try jerking your chicken on the grill. If you have any questions, please contact me. 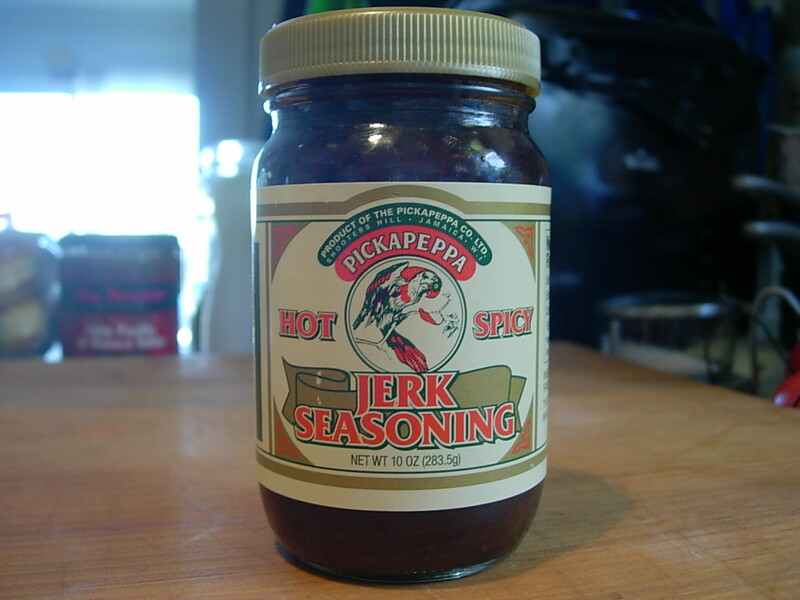 In the near future, I hope to have a jerk chicken cook-off, comparing 3 or 4 jerk seasonings I have on hand: Walkerswood Traditional Jerk Seasoning, Neera’s Hot Jamaican Jerk Spice Grilling Paste, and Pickapeppa Jerk Seasoning. I would LOVE to know what you think of this recipe! Please submit a Comment below! Wow, I am thrilled to find this site! I’m one of those stupidly gung-ho individuals who LOVES spicy stuff and then feels the consequences later… from both ends. Tough to find stuff that is spicy but doesn’t kick up the reflux, though. I’ll be back whenever I’m feeling daring (usually as soon as I heal from my last adventure! ), some of these recipes look great! @Tee – Glad you like the site. Thanks for stopping by. The recipes look very nice,today I will cook myself,^!^. 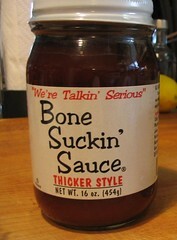 I’ve had that sauce, it’s great! Thanks for posting the recipe! You’re welcome. Thanks for your visit and comment.